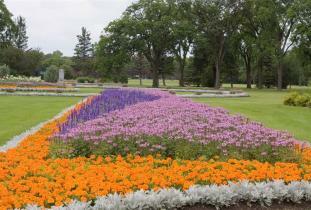 The following gardens located in Assiniboine Park are in addition to the Leo Mol, English, Formal, and WaterWise Gardens. Located in the Nature Playground, the Streuber Children's Garden is a bright, whimsical garden inspired by the classic childhood board game of Snakes and Ladders. The Abilities Garden at the Assiniboine Park Conservatory is unique in the City of Winnipeg. The garden is designed for those with limited as well as full mobility, with planters that allow visitors in wheelchairs to comfortably view and interact with the garden at eye level. Visitors will also find tactile areas of vegetables and planter gardens. The purpose of the Abilities Garden is to recognize the positive benefits of the interaction between people and plants and to improve cognitive, physical, social, emotional and spiritual well-being. The Herb Garden, located just south of the Conservatory, was created in 1997 in cooperation with the Herb Society of Manitoba and features a wide variety of culinary and medicinal herbs in a traditional circular layout. The Garden of Life, a cooperative effort with the Transplant Manitoba - Gift of Life Program, is also maintained by dedicated volunteers, and was created in 1998. This beautiful garden is located out in front of the Conservatory. The Garden of Life is filled with approximately 3000 flowers that depict the shape, colour or care of the vital organs used in human transplantation. The Garden is a tribute to living related and unrelated donors, organ and tissue donors and their families.